Preheat oven to 325°. Line 8-inch square baking dish with parchment paper. In food processor, pulse ginger snaps 20 times or until fine crumbs form; remove food processor blade and stir in butter. Firmly press crumb mixture into bottom of prepared pan; bake 12 minutes or until lightly browned. In large bowl, beat cream cheese with mixer on medium speed 3 minutes, scraping bowl occasionally with rubber spatula. Add cream of coconut; beat 1 minute or until incorporated. Add egg yolks, 1 at a time, beating 30 seconds after each addition. Add lime juice and zest; beat until smooth. Makes about 2¼ cups. Pour cream cheese mixture over crust; bake 18 minutes or until edges are set and center jiggles. Cool in pan on wire rack; cover and refrigerate at least 4 hours before cutting. 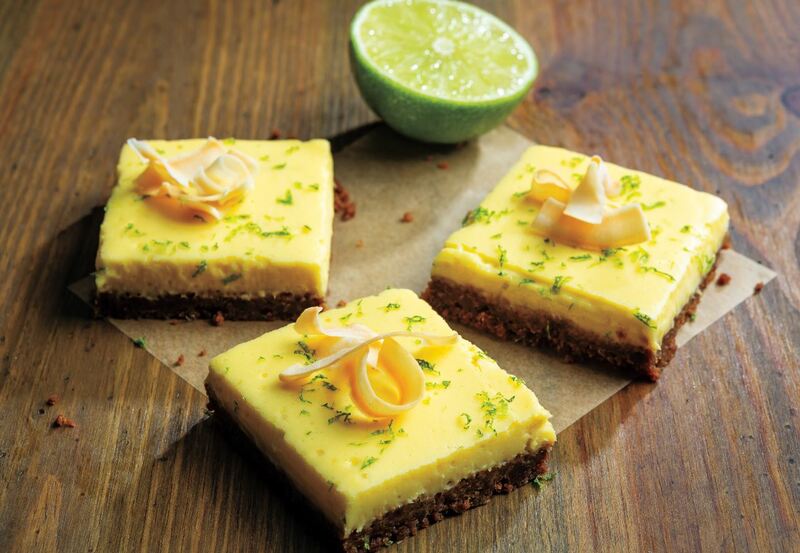 Cut into 12 bars and sprinkle with coconut chips; garnish with lime slices and lime zest, if desired.